A new puzzling trend has hit the garden center in the last couple of weeks that's been causing quiet the stir. It seems the niche market this year is 'fairy gardens', small little displays of plants with tiny benches or other doll accessories depicting miniature landscapes. Being a guy the concept is definitely lost on me , but my daughter will change my perception if she ever saw it. One thing did stand out that there's a fine line between shabby chic and plain ol'redneck landscaping and this borders right on the fringe of normal. 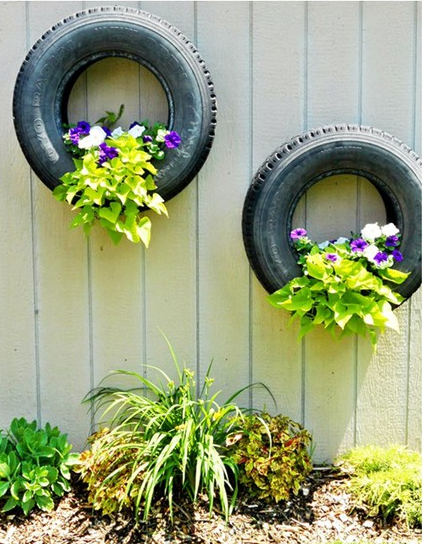 How can taking an old shoe and planting it up be any different than an old tire! In fact was shabby chic gardening really taken from an idea in a trailer park but 'prettied' up to make it more mainstream. I can almost see Martha Stewart discussing paint ideas for your tractor tire. What do you think a mullet would look like on her? I have way too much time on my hands. Please don't get me wrong, I don't mean to use the term 'Redneck' in a negative way as I see them as part of the fabric of American civilization but credit needs to be given to them for developing this original concept. I don't think it started as a 'Fairy' garden, but instead a way to recycle trash into treasure (see they're leaders of the whole green moment too!). 'Fairies' gives it that "Je ne sais quoi" needed to market it us culturally judgemental city slickers. They got one up on us! One day someone will write a book on 'Gardening the Redneck way' and when that happens we won't me thinking of them as simple folk, instead 'Inovators of the new modern American garden'! Hi ! I like your stories ! Slightly different perspective, which is refreshing ! 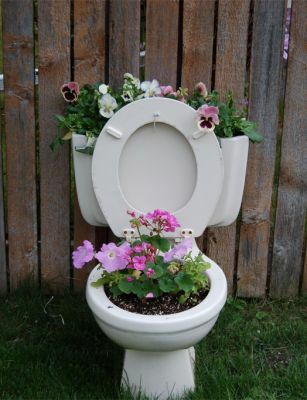 I've also seen flowers in toilet, and I really looked twice, and it was man's garden, of course. Thanks for reading. I can understand that a man would use the toilet bowl for a garden, I've found in my youth that it was optional. However, they make better reading chairs the older I get.